A gown of many faces; this stunning beauty has a separate bodice to skirt for that more bohemian, beach look. 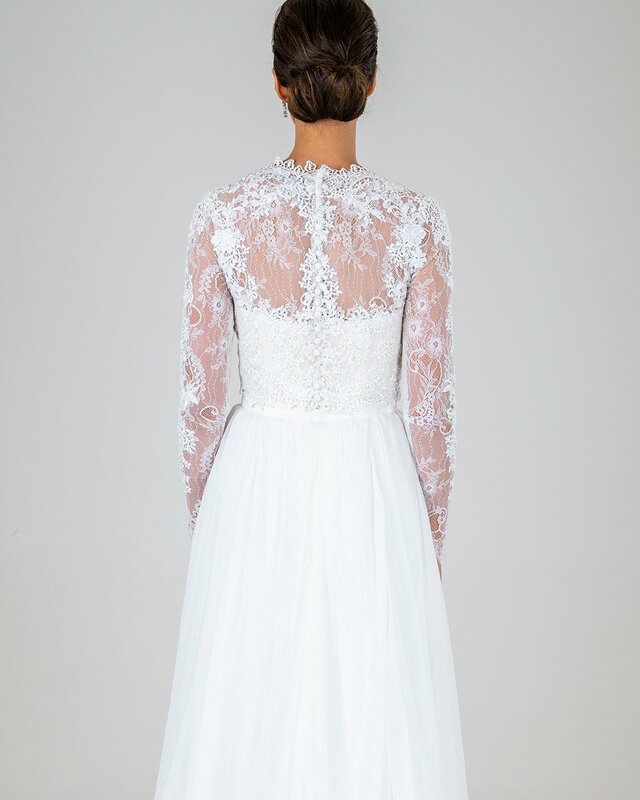 A heavily laced, long sleeve, high neck bodice that can also be lined for more support and structure, married nicely with a sweet flowy skirt that has a stunning full lace layer underneath. She can also be made with the lace long sleeve detachable to have a sweetheart bodice underneath for two looks. As with all our gowns any design changed can be made such as: strapless, fuller skirt, tulle skirt, fitted skirt, spaghetti straps, lower neck, capped sleeves, sleeveless, smaller/longer train, beading, a variety of colours, interchangeable lace and more.